Sunset Captiva, new kitchen, pickleball, heated pool & grill! MAY SPECIAL. $1700 per week. New kitchen. Open floor plan. All new porch furniture. Unpack and start your vacation. Our home is located in the village of Captiva within walking distance of shops, restaurants, beach, bay, pool, and tennis courts. The house is a 2 bedroom, loft and can accommodate up to 6 people. We also have a separate office. We pride ourselves on the condition of our home. We have our own private cleaner. If you take a moment to read our reviews they will speak to the condition of our home. One more thing to add. We like to keep fresh herbs growing on our stairs for your enjoyment. If you rent this home, you are renting a real home and not just a rental property. We have everything you could possibly need for Thanksgiving , Christmas dinner or every other dinner you would like to create here. We also have beach towels, beach chairs, umbrellas and a beach cart. Please look at our great 5 star reviews ! Provided for you. Dish detergent, dishwasher detergent and trash bags. We loved this house and our vacation. Even though a few in our group unfortunately experienced some illness during the week, we still came away with wonderful memories and a desire return very soon. We love Captiva and this house is spectacular. Everything we needed in the state-of-the-art kitchen, and bedrooms were spacious and beds very comfy. The roomy porch was a favorite place to hang out for all of us, including the kids. There is plenty of beach stuff--chairs, noodles, towels, sand toys, umbrella-- so we had no problem finding anything we needed. I would highly recommend this as a haven for families. What a terrific house, in an amazing setting. We have been going to Sunset Captiva for several years, and the place we normally stay in was booked, so we gave #50 a try. It was absolutely fantastic. It's beautifully appointed. Easily the best kitchen I've ever had in a vacation rental. I was a little concerned about its proximity to Andy Rosse Lane and potential noise, but no problem there: you can hear a bit of noise from the lanai just like anywhere in the Sunset Captiva complex, but inside the house I didn't hear a thing. Ruth is an outstanding host -- as attentive as you want her to be without being overbearing. Beautiful updated home that had everything we needed. We loved being in the Sunset Captiva neighborhood. Will definitely return to this home. So glad u enjoyed your vacation in our home. A wonderful vacation rental! Great location! Can't wait to return!! This was my family's first vacation stay on Captiva Island. Everyone was so pleased in my choice of accommodations. Sunset Captiva 50 provided ample space for my party of 6. The house was extremely well kept (beautifully decorated), comfortable, and CLEAN!! Maria does an excellent job!! I utilized the kitchen 3/7 evenings. Ruth has made a point to provide everything you can imagine for meal prep in her beautiful kitchen! The access to the beach was just a short stroll down the lane. The Sones' also have you covered for your beach outing. There were beach chairs, umbrellas, inflatables, beach towels, cooler, and even a beach wagon available to haul your beach supplies! This home is only a short walk to the local market, restaurants, and specialty shops. Just a FYI: There is a little place called Molly Malones (located at the local market) that sells fresh seafood (the scallops, coconut shrimp, and crab cakes were amazing)!! All in all, this is one of the best rentals that my family and I have stayed at. We would not hesitate in renting Sunset Captiva 50 from the Sones family in the future. Thank you so much for taking the time to write such a wonderful review. We look forward to your return. 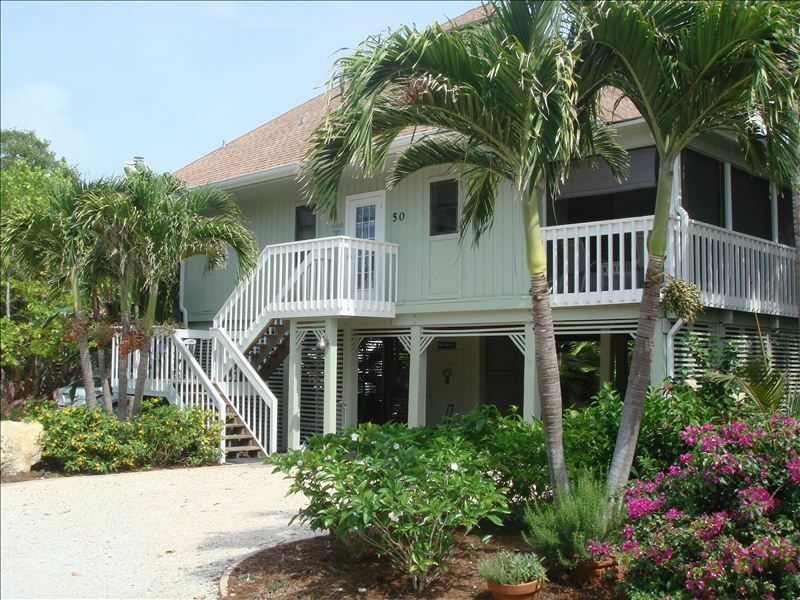 Beautiful beach house in Sunset Captiva! We have stayed in many of the homes in Sunset Captiva, and this was one of the best.